Churches that want to offer their members a way to donate virtually have several online giving solutions to choose from. As covered in a previous post, PayPal Donations, EasyTithe, Stripe and Continue to Give are all good solutions for small- and mid-sized churches. Large churches, however, will find that these four options either don’t meet all their needs or are expensive when instituted on a big scale. 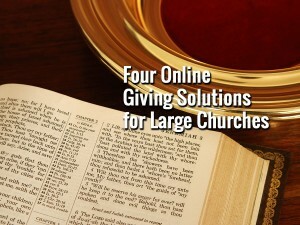 If your church is large and looking for an online giving solution, here are four options that are well-suited for bigger churches. EChurchGiving’s Pushpay has low rates for large churches, and it provides an easy and fast user experience. EChurchGiving doesn’t provide merchant accounts, but they work with several partners who do. Their partners transaction rates usually vary between 2 and 2.5 percent, which are among the lowest in the industry. In addition to these transaction rates, EChurchGiving charges a monthly fee. 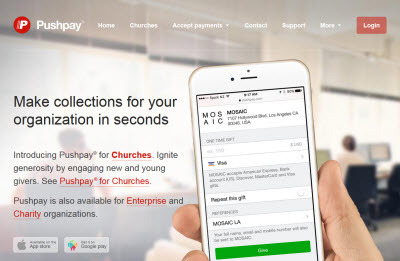 Pushpay for churches, which includes mobile, kiosk, online and text giving, costs $99 per month, but most churches use custom plans that have slightly different monthly fees. Pushpay makes giving about as easy as it can be. Giving online, at a kiosk, through the Pushpay app or by text all take just 10 seconds, making this the only comprehensive giving solution that has 10-second giving for all four modes. For churches that already have an app, the Pushpay app can be integrated into an existing app. Pushpay is a good choice for churches that have lots of members who give online. The low transaction rates more than balance out the monthly fee if lots of offerings are made online, and its 10-second giving promise makes it easy to get church-wide support for the platform. SecureGive’s products and services are similar to eChurchGiving’s, although the two company’s marketing strategies are different. 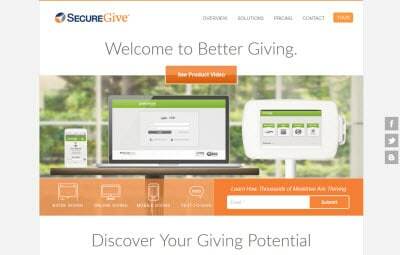 While eChurchGiving focuses on ease of use by touting its 10-second claim, SecureGive advertises its security features. Pushpay is slightly faster to use, and SecureGive has excellent security features, but these differences are negligible. Both companies offer fast and safe mobile, kiosk, online and text giving options. SecureGive’s pricing structure, like eChurchGiving’s, includes a monthly fee and transaction rates. SecureGive’s most basic plan, which includes mobile and online giving only, is $29 per month and a flat transaction rate of 3.95 percent. More robust plans have higher monthly fees and lower, tiered transaction rates. Any church that is interested in eChurchGiving should also look into SecureGive. Choosing between the two is like picking between two churches of the same denomination in neighboring towns. They’re similar but have slightly different feels. QGiv offers higher levels of service than either eChurchGiving or SecureGive. QGiv also has higher fees, though. Unlike eChurchGiving, QGiv processes transactions, so there’s no need to work with a second company that takes care of actually processing donations. Churches only need to call QGiv if they have questions about a transaction, and a representative will answer their call almost immediately–the company boasts near-zero hold times. Although SecureGive is secure, QGiv takes security to another level. QGiv was the first online donations processor to become Level 1 PCI compliant, which is the highest level of compliance. They also regularly have independent audits performed to ensure all systems are safe. QGiv doesn’t have monthly fees, but it’s transaction fees make the service more expensive than either eChurchGiving’s or SecureGive’s for churches that receive lots of online donations. Visa, MasterCard and Discover donations are charged a transaction rate of 3.95 percent plus $0.25 per transaction. American Express donations are charged the $0.25 per transaction fee and a transaction rate of 4.95 percent. Churches that already have merchant accounts may qualify for lower transaction rates, but these rates are not discounted for churches that receive a lot of donations. There also is a $199 setup fee for the main online giving package. QGiv is well-suited for churches that the best support and security available, and can afford to pay for an excellent level of service. QGiv doesn’t offer kiosk giving, but mobile, online and text giving are overtaking kiosk giving. Authorize.net is perhaps the most popular online giving solution for large churches, as it is both the most affordable and most customizable. Through Authorize.net, churches can obtain merchant accounts that let them process their online donations themselves. You can also setup a merchant account with a local bank and use authorize.net as your gateway. Think of a gateway as the internet version of a card swipe machine. People fill out the donation form on your website and that information is securely sent to authorize.net (this is that the SSL certificate does) then authorize.net connects with your merchant account. Setting up a merchant account includes several different expenses, such as SSL certificate fees ($89/yr), merchant account minimum fees (around $20/mo), transaction fees and gateway fees ($10/mo). Despite all of these fees, Authorize.net is usually the cheapest online giving option for large churches. Because of the low transaction fees this is the solution most all eCommerce sites use. For churches that are already working with a church website development team, integrating a custom online giving solution that processes donations through an Authorize.net merchant account is easy. Developers can easily create one-of-a-kind giving forms and pages that securely pass on members’ information to Authorize.net. Most shopping cart systems will also work with authorize.net. 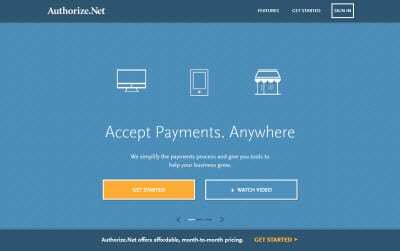 For big churches that want to process online donations, payments for sermon DVDs and event registration fees, a merchant account from Authorize.net is the comprehensive solution that will handle all of these charges. When implementing an online giving solution, your church must first decide who will be doing the work. If your church is already using a website development team to create its church website or an app, setting up a merchant account with Authorize.net will keep the fees your church pays minimal and give your church flexibility to adjust the giving system to its needs. If your church doesn’t have a relationship with a developer, eChurchGiving, SecureGive and QGiv may be suitable options.